The Pinnacle Award Program recognizes outstanding educational facilities in the Pacific Northwest Region. The program follows criteria from the Association’s LEsolutions Planning & Design Awards Program, so as to encourage regional projects to also compete at the international level. To read the full requirements and submission details, click here. The Pacific Northwest Region is pleased to offer a scholarship up to $1,500 to a PNW member of the Association. 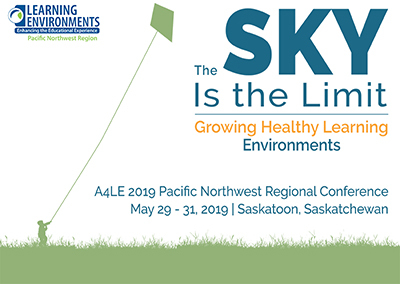 The funds shall be used to attend the Pacific Northwest Regional Conference in Saskatoon, Saskatchewan, May 29-31, 2019. The purpose of this scholarship is to expand the mission of A4LE by making this important conference available to persons who might otherwise not be able to attend. Winner notified on or about April 19, 2019. The Pacific Northwest Region is pleased to offer a scholarship up to $1500 to a PNW member of the Association who is working in the profession of school planning and design. The funds shall be used to attend the LearningSCAPES Conference in Anaheim, CA, October 4-6, 2019. The purpose of this scholarship is to expand the mission of the Association by making this important conference available to persons who might otherwise not be able to attend.